Goldspotted Oak Borer (GSOB) – Treatments by Aguilar Plant Care. Goldspotted Oak Borer (GSOB) is an invasive pest that is accounting for large numbers of oak tree mortality in many areas of San Diego County and now spreading to Orange and Riverside counties as well. APC is currently working with multiple communities and organizations to help protect their oaks. Del Dios Habitat Protection League – Lake Hodges, Del Dios. City of Escondido – Daley Ranch, Dixon Lake, Grape Day Park, and other city historic trees. Along with hundreds of private properties and homeowners throughout the San Diego region. 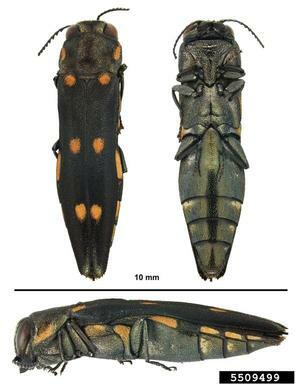 (GSOB) Gold Spotted Oak Borer adult females lay eggs in cracks and crevices of oak bark. Once eggs hatch, the larvae burrow into the tree where they feed beneath the bark of Oaks near the interface of the phloem and xylem, the nutrient and water conducting tissues of the oaks. Feeding larvae kill patches of cambium, which eventually causes tree death. Any Oaks showing decline/ discoloration or symptoms of GSOB prior to treatment may not fully recover. Any Oaks showing advanced stages of decline (40% +), and rapidly discoloring foliage should be evaluated for removal immediately, in effort to reduce possible spread to nearby oaks. According to the UCIPM,GSOB Field ID Guide, “heavily infested oak trees will likely die in the next few years, regardless of treatment or management practices”. It is highly recommended if you are in a “GSOB Zone of Infestation (ZOI)” to have a management plan in place for GSOB control. UC Cooperative Extension’s site shows the infestation zone as of 2018. Map courtesy of Kim Corella at CalFire. Preventing movement of infested wood (primarily firewood) to new areas is essential for slowing the spread of this exotic borer to other regions of the state. Contact insecticides applied applied prior to GSOB adult activity, which begins in early to mid-May. Contact treatments should be applied to the main stem and large diameter branches to reduce numbers of GSOB adults and their egg laying. Trees should be re-treated every year until additional data is collected regarding the duration of efficacy. Although woodpeckers are known to forage on (GSOB) goldspotted oak borer larvae, their feeding is not sufficient to significantly suppress populations. No other significant natural enemies of the pest are currently known in California, but research on biological control is continuing. It’s important to note, that if your oaks are candidates for insecticide treatment, that a trained, qualified and licenced pest control applicator makes the application. Certain insecticides are restricted and improper applications can have significant negative impacts on natural enemies, bees, wildlife, and water quality. APC is a GSOB treatment specialist and has all the required licensing, experience and knowledge to help treat your oaks for GSOB control. 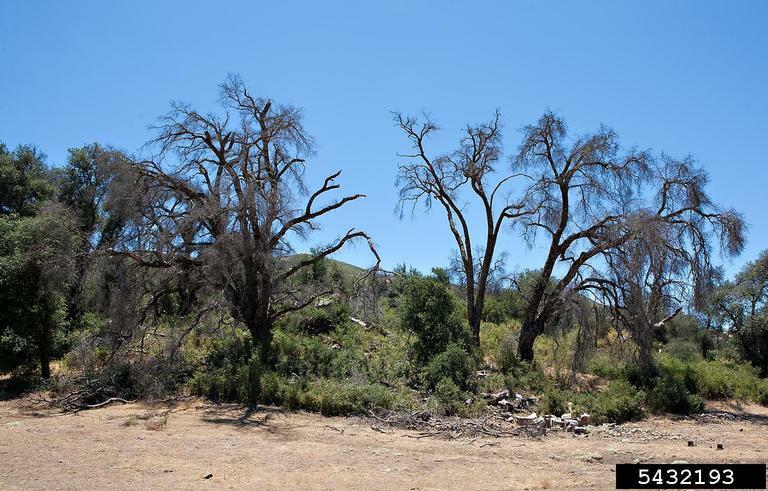 Below are pictures from a recent (April 2018) investigation of oak trees in the Daley Ranch area of Escondido. We partnered with the City of Escondido (Chris Gunther – City Master Arborist), Tracy Ellis (Entomology Lab and Honey Bee Protection Program Department of Agriculture County of San Diego), Kevin Turner and Curtis Ewing (CAL FIRE) to inspect the oak trees at City Of Escondido’s Daley ranch. Unfortunately, we found one of the larger trees in the preserve infected and declining due to GSOB.